I read this article and found it very interesting, thought it might be something for you. The article is called Restaurant Review: Bread and Bones and is located at https://www.totallydublin.ie/food-drink/restaurants/restaurant-review-bread-and-bones/. Remember that Buddha Bag shop on Millennium Walkway? Bread and Bones opened in that very unit in April of this year. On the surface, this casual eatery is along the same lines of places that have been flooding the casual dining market in the last few years, like Meat Wagon and Pitt Bros. It’s got the walls made from palettes, the waiters who are definitely musicians in their real lives and the main course price tags that never get very far away from €10. Bread and Bones have thankfully moved their menu beyond the proliferation of pulled pork and slaw, and are instead catching up with the more internationally current trend of Asian influenced street food by way of ramen, bao (steamed buns) and kimchi. ‘A lot of our inspiration has come from restaurants such as Momofuku in New York, Banh Mi Boys in Toronto, Bone Daddies and Flesh and Buns in London, and Uncle in St Kilda, Melbourne,’ says Jack Fox, who co-owns Bread and Bones with Duncan MacDonald. 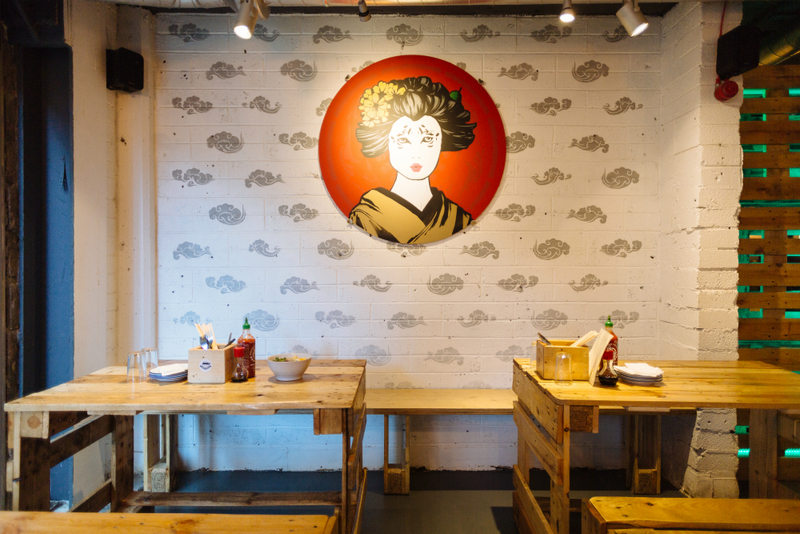 Their head chef Modh Fadhil Kasmuid (known in the kitchen as Caat) is from Malaysia, so they’ve pooled their knowledge to bring a bit of bao to Dublin. The staff are great. It’s truly a gift to pull off friendly, familiar service with sincerity. Our server Ciara has mastered this art, and I’m not even sure she knows it. She looks after us in a beautifully effortless way throughout the evening. About halfway through our main course, she takes over from the dude who is unobtrusively singing covers in the corner to strum a few songs herself. It’s a cliché that all waiters are artists waiting to be discovered but with Ciara this might actually be true. Hopefully Bread and Bones can hang on to her a bit longer, at least until my next visit. The menu is split between three neat sections; bites, bones and baos. From the bites, we order pork croquettes (€5) and kimchi fries (€5). The panko-crusted pork croquettes from the bites section work well as an appetiser, though the ratio of spud to pork is off for me – they need more pork. The kimchi fries are slim chips topped with a heap of house-made kimchi and a squirt of garlic mayo. I love kimchi and I want these fries to blow me away but I’m left underwhelmed – there’s no marriage of flavours to make this transcend your typical bowl of fries. It’s good, but I want it to be awesome, and it doesn’t quite get there for me. From the bones, I choose the braised beef ramen (€10) over a selection of pork, chicken, tofu and spicy seafood. 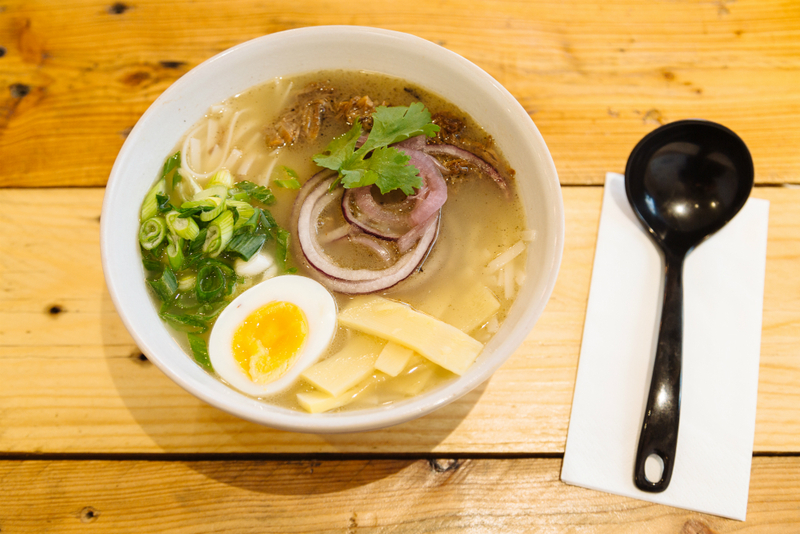 The ramen broth is pleasingly subtle, and the braised beef is oozing with slow-cooked flavour but the longer the beef sits in the broth, the oilier the ramen becomes. ‘Our ramen is made in tonkotsu style,’ Fox explains, ‘which is very popular in Japan because of its high fat content. Similarly, Bone Daddies in London makes their ramen in this style and offers a side of extra fat, should customers want it! It’s not to all western tastes, but it’s something we’re trying to find a balance with, so that it can be enjoyed by everyone.’ At €10 it’s great value per bowl. What I’ll be returning to Bread and Bones for are the Bao; steamed buns conveniently sliced like fluffy, sticky pitta pockets, served in a bamboo basket. It’s perfect for sharing, but you won’t want to. You can choose a choice of six fillings, from chicken, beef, crispy fried tofu (starting at €12) or Silverhill duck (the most expensive at €16). We go for the confit duck leg, which appears intact and on the bone. It’s been treated very well in the kitchen, its moist flesh protected by a deliciously crispy skin. We tear it to pieces ourselves and stuff it into our warm, steamed buns, topping with the accompanying hoisin sauce (just the right amount of sweetness), thin rounds of pickled beetroot and a salad of coriander, cucumber and chillis. I appreciate the effort to source and name Irish suppliers such as Silverhill duck and Murphy’s ice-cream. 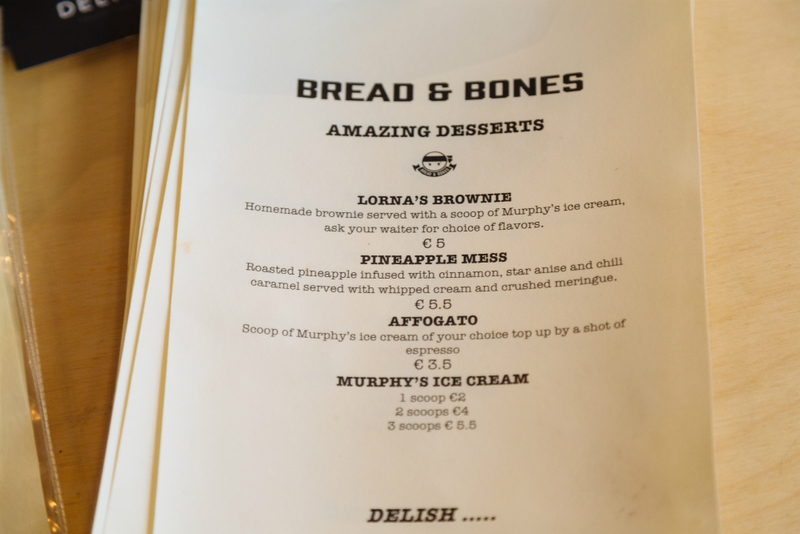 Over dessert, a Murphy’s brown bread ice cream affogato (€3.50) is a little over-shadowed by our pineapple mess (€5.50), a tropical take on the fruit, cream and meringue favourite. Here, they’ve roasted the pineapple in cinnamon, star anise and chilli caramel and laced the cream with tarragon for an aniseed kick. It works for us. Our bill, which includes two bottles of the Australian craft beer Little Creatures (€5.50 per bottle), and two non-alcoholic Brewdog Nanny State (a complexly flavoured revelation in alcohol-free beer drinking at €4 a bottle), comes to €65. I’d love to see those little creases in the food ironed out in the coming months; they might well be serving the best bao in Dublin but so far they have no competition. I want to see a cleaner ramen and more flavours generally. Move over BBQ, the bao has landed.